조선 후기 만들어진 문방구류의 일종으로 종이를 담아두는 통으로, 크기는 높이 16㎝, 아가리 지름 13.1㎝, 밑지름 12.6㎝이다. 원통형을 하고 있으며 겉모습은 간결하면서도 당당하다. 아랫부분 굽 위에 한줄의 푸른색 선을 두르고, 그 위로 세 곳에 활짝 핀 난초 한 포기씩을 소박하고 세련된 필치로 그려 놓았다. 난초문양은 밝은 청색으로 더욱 깔끔하고 담백한 느낌을 준다. 유약은 옅은 청색을 띠는 흰색 유약으로 전체에 고르게 발라졌다. 유약의 형태나 청색문양으로 보아, 18세기 전반에 광주 금사리 가마나 이 보다 조금 늦은 시기의 분원리 가마에서 제작된 것으로 보인다. 조선 후기 경기도 광주지방에서 제작된 종이를 담아두는 통 가운데에서 형태나 문양, 유약을 바른 모양이 가장 빼어난 작품이다. This paper container from the late Joseon Period has height of 16 cm, mouth diameter of 13.1 cm, and base diameter of 12.6 cm. It has a simple yet majestic cylindrical shape. The lower part of the heel is rounded with a single blue line, with orchid plants in full bloom depicted on three different locations just above the line with simple yet fine touch. The orchids are painted in blue to give a neat feel and look. White glaze with light blue tone is applied evenly throughout the surface. 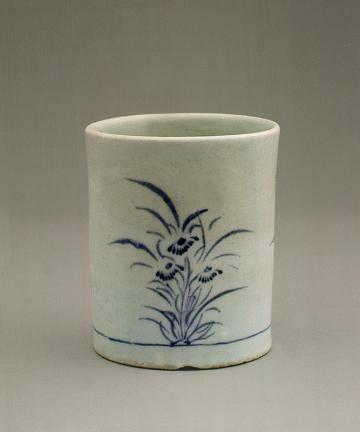 Based on the type of glaze and designs in underglaze cobalt blue, it is presumed to have been produced either at the kiln in Geumsa-ri, Gwangju during the early 18th century or at the kiln in Bunwon-ri a little later. 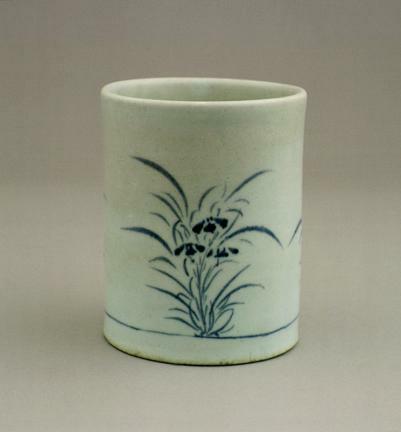 Among all the paper containers made in the Gwangju area during the late Joseon Period, this is considered to be the best in terms of shape and design as well as the way the glaze is applied.